“The Dance of Conversation: Strategies for Encouraging Children’s Language Development,” is a lyrical illustration of specific conversation strategies adults can use to encourage authentic interactions with children that enhance their language and learning. A Companion User’s Guide describes the philosophy behind these strategies, suggests practical exercises and activities to practice the strategies, and includes a bibliography for further reading. To view an excerpt, click here. “Earning the Right: the Story of INREAL.” This video recounts how educators at CU helped spark a revolution in early childhood education focused on speech and language. CU’s “INREAL” training program was instrumental in breaking out of the confines of the behavior-modification regimens of the 1960s and into a more child-centered, observation-based, humane teaching program. 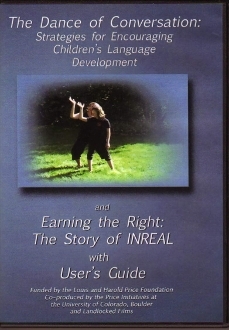 This video captures the origins of INREAL through interviews with its founders, and examines how the method has matured into a multi-disciplinary approach to educating young children and training educators at CU’s Child Learning Center. Co-Produced by The Price Initiatives at the University of Colorado, Boulder.